New and Improved Sea Eagle FastTrack™ Inflatable Kayaks with an even More Aggressive Design, Standard Swept Back Skeg, and new in 2017 “Overbuilt” Super Seams. Now with a new patented, state of the art, external, rigid, inflatable NeedleKnife™ Keel for a faster, smoother paddling experience! The FastTrack series is byfar one of our favorites among the line of Sea Eagle products. We choose the Sea Eagle 385 Deluxe for it’s awesome stability, light weight portability, speed and tracking, and overall versatility. Elderly paddlers feel at ease in the water and especially appreciate the handiness of the light weight 34 pound Sea Eagle 386 Deluxe on shore. Enjoy the back support provided by the easy to rig inflatable Deluxe Kayak Seats. We choose the Sea Eagle 385 Deluxe. We think you should too! Sea Eagle FastTrack™ Kayaks are sleeker and faster and than ever before! The FastTrack’s™ combination of sleek, curved, touring shape with state of the art “NeedleKnife Keel” provides true rigid kayak performance with the benefits of an inflatable. Most importantly, the FastTrack™ is designed to be extremely safe and stable. If you’re looking to paddle lakes and open water, the FastTrack is unmatched in speed and usability. It can be paddled in light whitewater, making the 385 FastTrack one of the most versatile inflatable kayaks available! A great feature is the fact that Sea Eagle FastTrack™ kayaks weigh far less than most all-rigid kayaks. 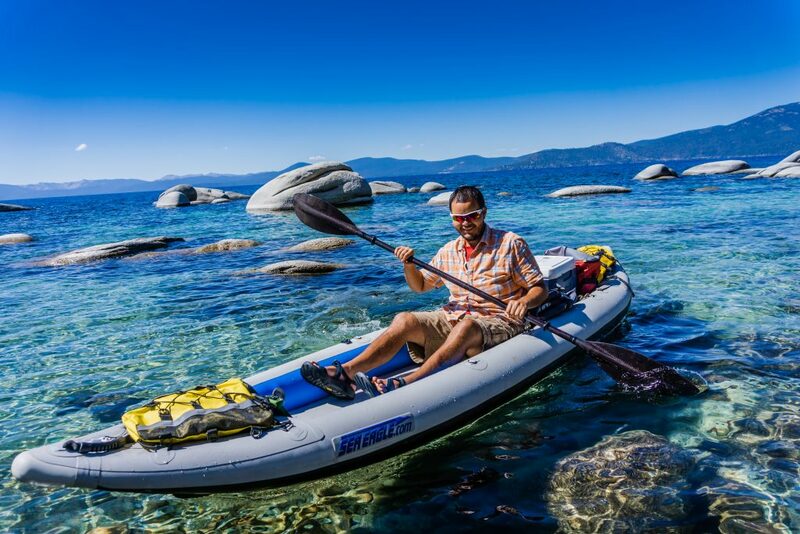 Rigid kayaks can weigh 65-70 lbs, our Sea Eagle FastTracks™ weigh just 35 & 44 lbs respectively. This makes handling our kayaks a dream by comparison. Best of all, because FastTracks™ are inflatable they can be packed into a bag that’s a mere fraction of their size! Sea Eagle FastTracks™ are a breakthrough in design that combine high performance paddling with ultra-light weight and stow-able portability. Have any additional questions? We love to talk about boats! Feel free to chat with us on our website, or fill out our contact form! Hull Weight : 35 lbs. Length : 12 ft. 6 in. About five years ago, I bought my first Sea Eagle from these fine folks. It was a 385 FT. I got a lot of wonderful miles out of it. Today, I was able to pass it on to the East Polk County (TN) Rescue Squad for water rescue. It will keep giving and maybe help save a life one day. Thank you so much for your attentionto the purchase of my new FastTrack. All your videos and other advice isvery much appreciated. I’m not sure if anyone else wouldhave been as easy and as informativeas you have been. I’ve been looking for a kayak for yearsand finally decided to look at inflatablesdue to weight and transportation needs. I’m getting to old to carry 60 pounds of kayak to and from the launch site, letalone put it on top of my SUV. Your excellent advice and info made ita no brainer for the FastTrack. Thanks again and have a great weekend. I continue to be extremely satisfied with my FastTrack 385, purchased from you folks a couple years ago. I continue to make short YouTube videos about my ‘Grandpa Adventures’ in the boat. One recent tongue-in-cheek video features a short trip with my 12 year old grandson, Sam:Thanks for many happy hours in my FastTrack, including last weekend – two days down the Namekagon and St. Croix rivers. Gale…you’re my hero! Greatest video ever. You’re Grandson will never forget the memories of his time with Gramps’ on your many jungle adventures.